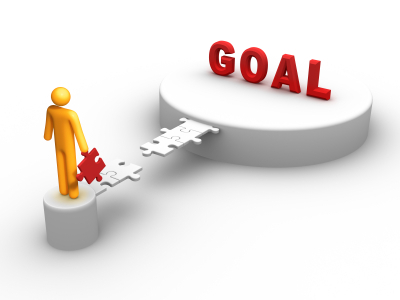 What has been most helpful to me in my student and professional careers is setting goals. For myself I know I need to have some sort of vision of where I am going before I can even start. By creating goals it gives me a clear path to the vision but gives me something to work towards. I’m a person who likes to create lists. By checking a task off a list gives me instant gratification and motivates me to keep moving forward. To me goals are like a list of things I have to do. I have my big picture goal and then I have a list of things I need to go to get there. Also by writing down goals I have a way to hold myself accountable. So for those of you who struggle with setting goals for yourself here is a simple model to follow. This process is called S.M.A.R.T. goals. Some of you may have seen or heard about this before. It is a commonly used practice to set up effective goals. Each letter is a step for setting goals. I will outline each step for you. Measurable: You have to have a way to measure your progress or success. If you wanted to measure your progress on buying your car you could keep a running balance of your savings thus far. If you are not on pace to your goal you will easily be able to identify this and make adjustments. Attainable: Make sure this is a goal that you can reach. If you make $20,000 a year it would not be attainable to say you want to buy a Bentley in the next 6 months with $2,000 down. Having high expectations is good but you need to make sure its within your reach…otherwise it’s just a dream. Realistic: The goal needs to be something that you are willing and able to do. Again with the Bentley example, if you had an income that could support you in getting the high-end luxury car then it would be a good goal to make but in this case with just $20,000 a year it would be realistic to pick something more in your budget. Timely: Your goals need to have a timeline attached. If you don’t have a timeframe you will feel like you are working forever with no end in sight. In the example I have been using the timeline was stated in the beginning. Remember goals are there to help you. Spending a little bit of time on goals will help you have better results. Once you write your goal and follow through you will be happy that you did it.